I was going to begin today’s column by apologizing for yet another update on how to make homemade laundry detergent. Then it struck me. These aren’t really changes … they’re improvements. Look, if Gain and Tide can produce “New! Improved” versions of their laundry products, so can we. 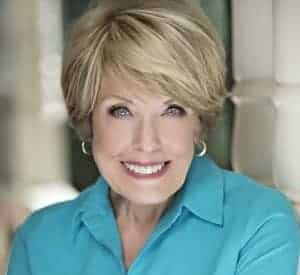 First, and I’m talking about years ago, I gave you a liquid laundry detergent recipe that required grating, cooking, stirring and storing a thick gel-like substance in a 5-gallon bucket. I believe at one point I suggested keeping a baseball bat handy to stir the stuff before each use. Then came the New! and Improved! powdered version where you could pretty much grate, mix and be done with it. Storage was quite simple and the results were pretty good, provided you could find the right bar soap to grate and you weren’t opposed to dedicating one cheese grater for soap only (the stuff would be nasty in mac ‘n cheese). 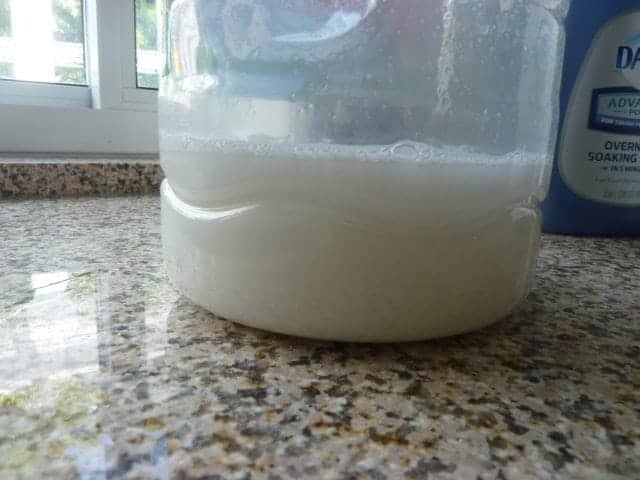 It was a happy day when I figured out how to make liquid detergent that requires no grating, (that means no Fels Naptha! ), makes three gallons at a time and even looks pretty in a decanter. That was the version that brought traditional blue Dawn into the equation. And I used 1 to 2 cups of the final product in each load of laundry. That was such a New! and Improved version. But then I started thinking about this. 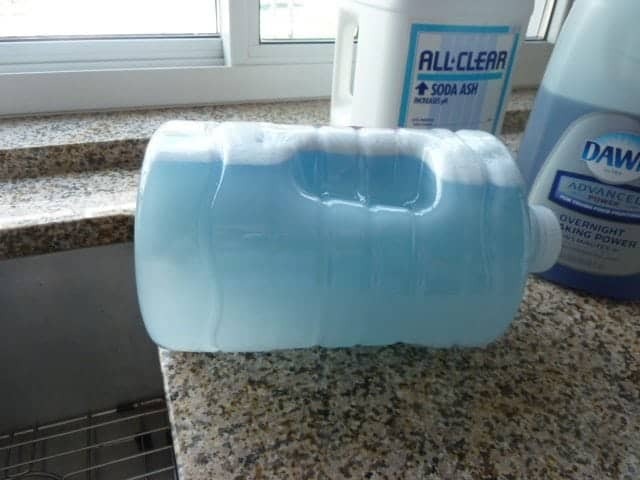 Why add three gallons of water only to come out with a very thin product that required at least 1 cup of the stuff to wash a load of laundry? Some of you had the same thought. Couldn’t we concentrate this in some way? And with that, I could feel a New! and Even More Improved! version about to emerge. And sure enough with a few alterations, I came up with a more concentrated version that requires only 1/4 cup of detergent per load. Fabulous, right? I thought so, but lots of mail, questions and even an angry reader here and there left me doubting. 1 one-gallon container with tight-fitting lid. 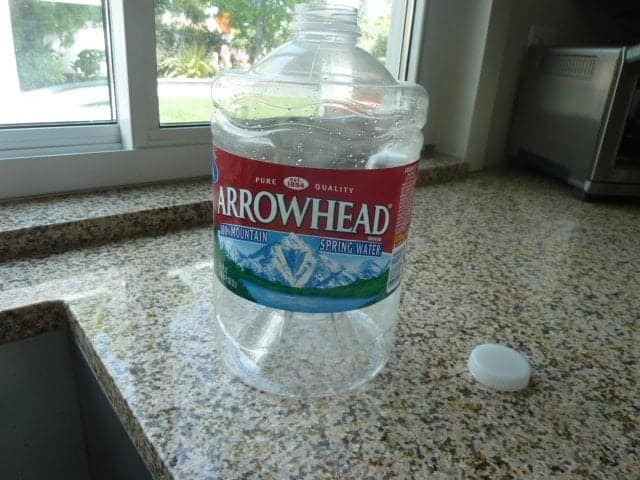 I used an empty Arrowhead water container. Twenty-Mule Team Borax. 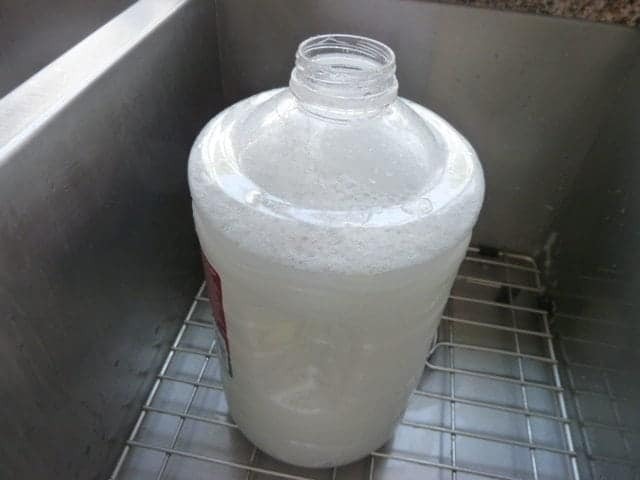 Find this, or any brand of borax, in the laundry aisle of your supermarket or a department store like Walmart or Target. 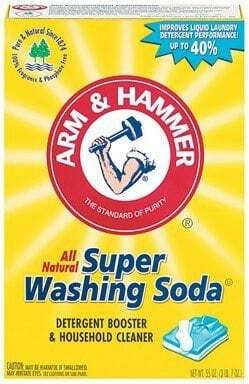 Super Washing Soda OR soda ash. Super Washing Soda (sodium carbonate) is becoming increasingly difficult to find. 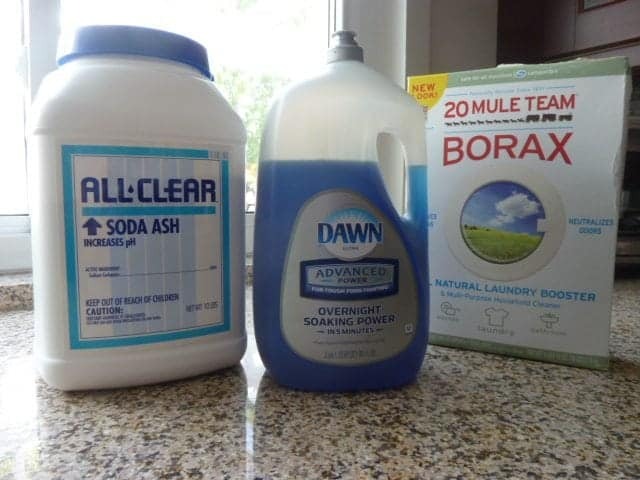 If you can’t find it in the laundry aisle somewhere close to the borax, consider using soda ash (sodium carbonate) instead. Soda ash is exactly the same thing as Washing Soda, and is used in swimming pools to fix the ph. It’s readily available in pool supply stores or even larger department stores that carry pool chlorine, and so forth. 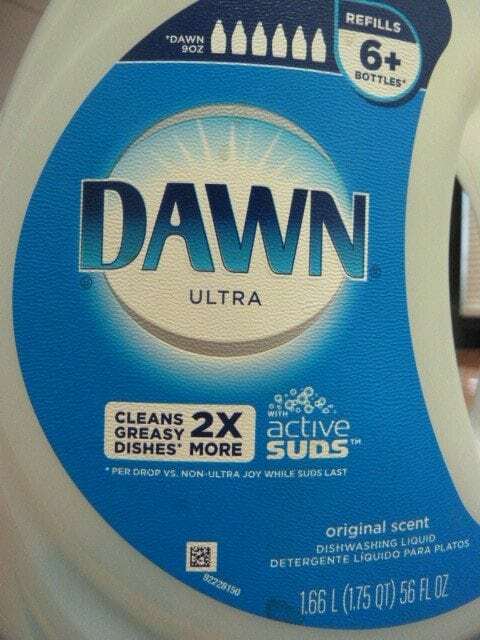 Blue Dawn dishwashing liquid. There seems to be multiple versions of blue Dawn these days. I’ve seen it sold as “Original,” “Ultra Concentrated” and most recently, ” Advanced Power.” I’ve tested all of them and I can detect no difference in the final product we’re going to make here. As long as it’s blue and it is authentic Dawn—not some look-alike store or generic brand—use it. 3/4 cup measuring device. If you don’t have one that is exactly 3/4 cup, improvise. 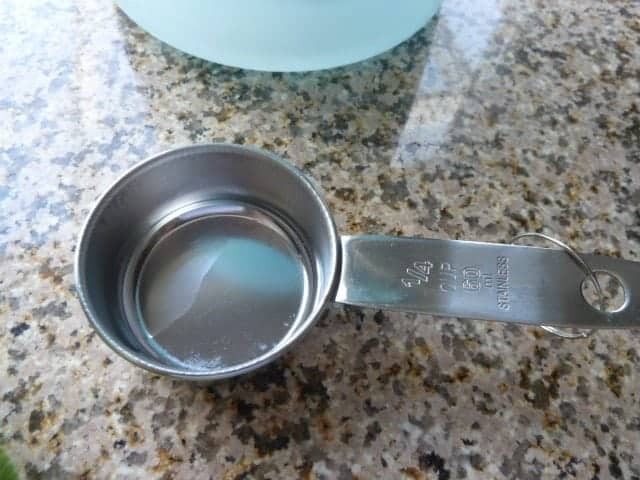 You could use a 1/2 cup with a 1/4 cup measuring device to come up with 3/4 cup. Or if you have a large measuring device with some way to measure out 3/4 cup, you’ve got what you need. 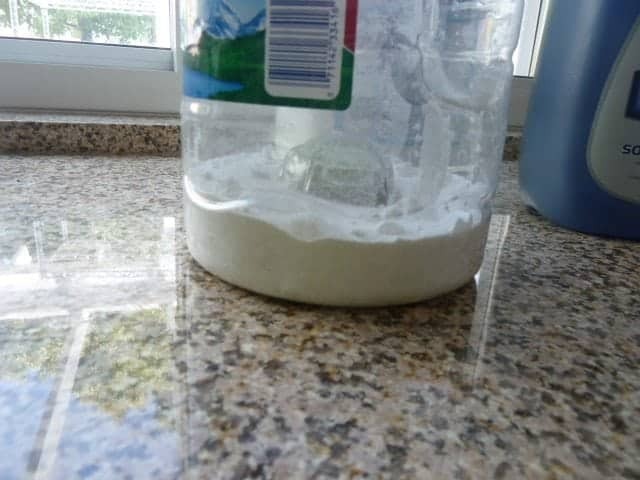 Step 1: Measure 3/4 cup borax and 3/4 cup Super Washing Soda (or soda ash as I am using in this tutorial) and pour both into the empty one-gallon container. Step 2: Add about 2 or 3 cups water. You’ll see a few bubbles form, but nothing to be concerned about. Step 3: Apply the lid and shake the container vigorously until the powdered ingredients appear to be dissolving. Give yourself a little workout here and shake it well so it looks incorporated and milky like this. 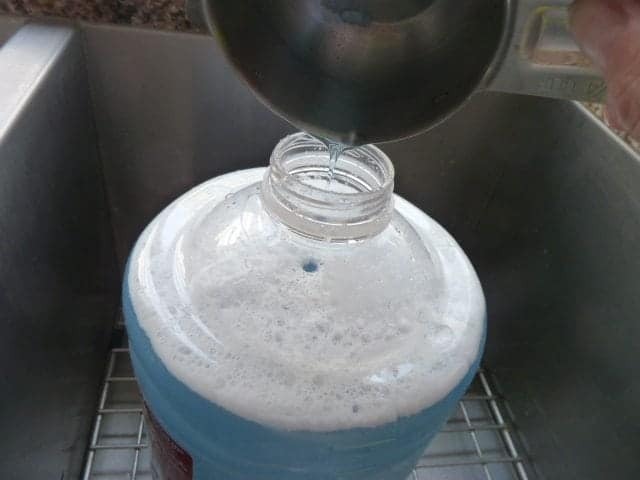 Step 4: Fill the container with cold water to within about an inch of the top, more or less depending on the shape of your container. You want to leave enough room for the Dawn which is coming up. 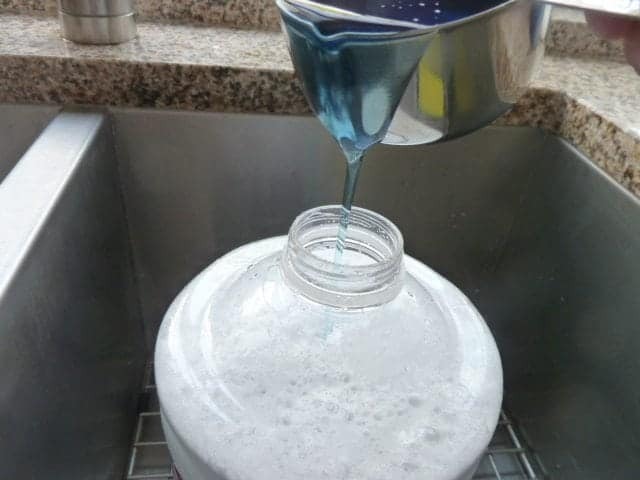 Step 5: Pour in 3/4 cup blue Dawn dishwashing liquid. Slowly …. 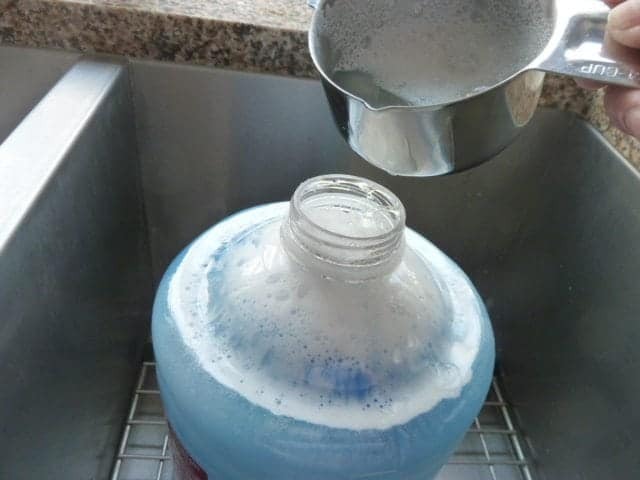 you don’t want to create a lot of suds or bubbles. 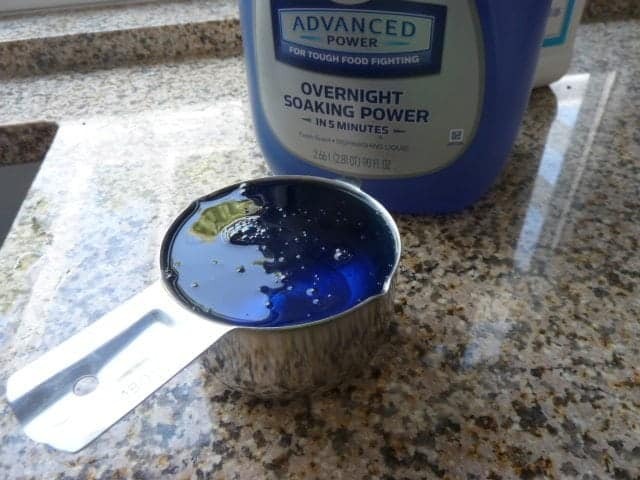 Step 6: Once you’ve poured in all of the Dawn, fill that measuring cup with more water so you can top off the container and rinse out the last of the Dawn. 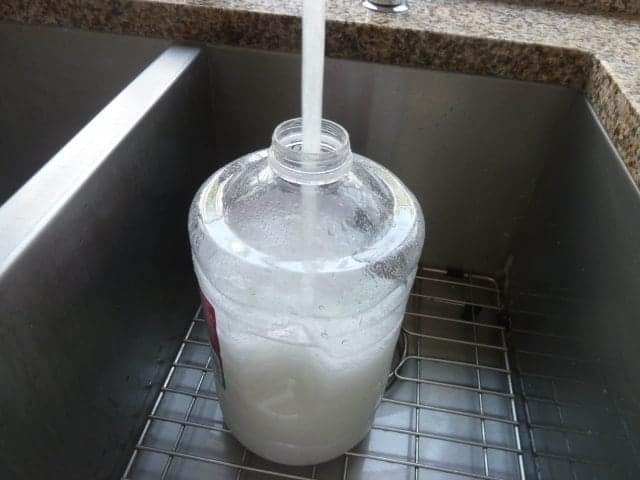 If you still have room, add more water until you are about 1/2-inch from the top. Step 7: Apply the lid. This should be quite easy because you will not be contending with suds or bubbles. Notice how the dawn is not fully mixed up. That’s fine. Just get that lid on tightly. Step 8: Instead of shaking it up, just lay the container on its side and roll it around a bit to get everything mixed. Please notice that without any kind of cleaning up at all, the counter is dry with no mess, no suds—quite clean and tidy, don’t you think? Yay! We’ve overcome the suds-to-infinity problem so many of you encountered. Take a moment to admire your beautiful homemade product and then let’s get to the laundry room where you will need your gallon of laundry detergent (the one you just made, silly!) 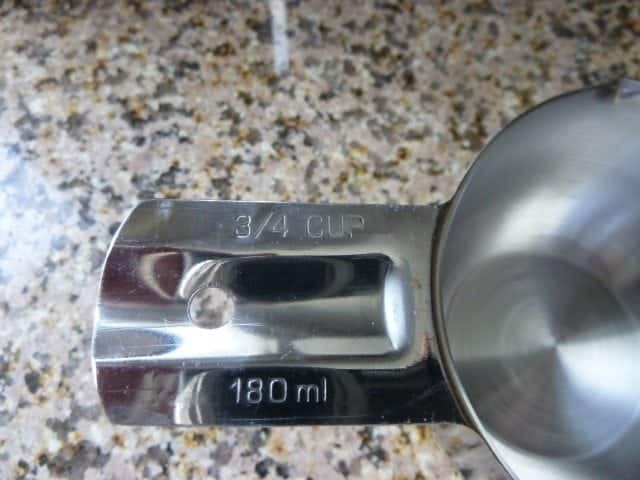 and a 1/4-cup measure. 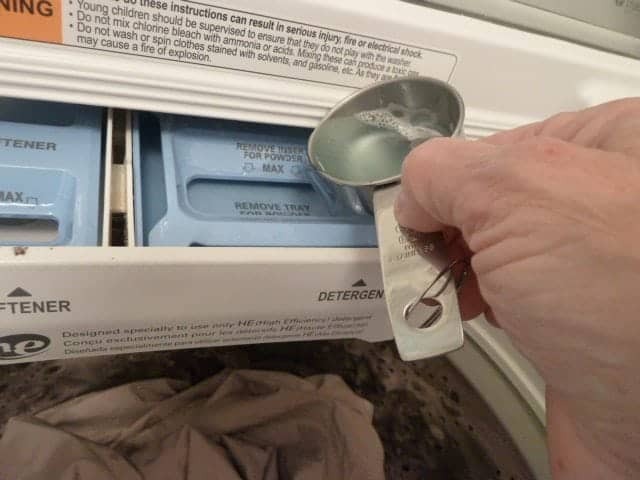 Measure out 1/4 cup detergent. 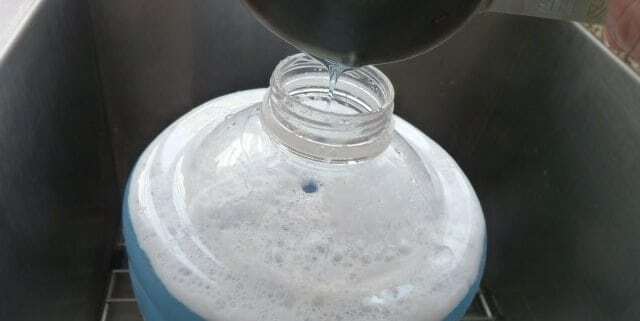 Pour it in the way you have always added detergent to your washer. 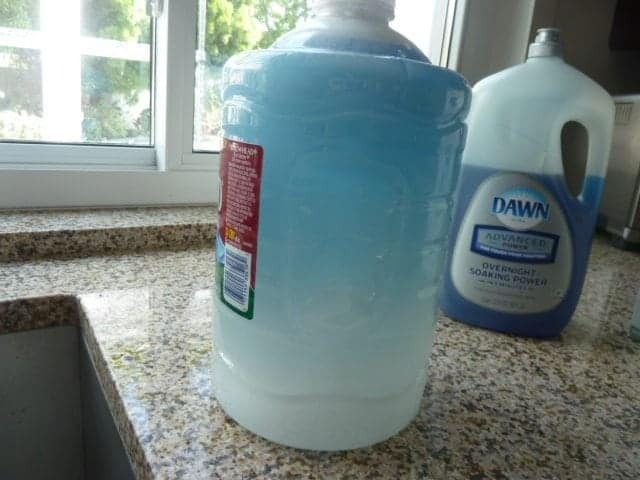 If you have a little detergent dispenser, that’s where this tidy 1/4 cup of beautiful liquid goes. If you’re like me, your first thought is, “Oh that cannot possibly be enough!” But it is. My washer is a top loading HE by LG with Wave Force. It’s quite possibly the best washing machine I have ever used in my life. 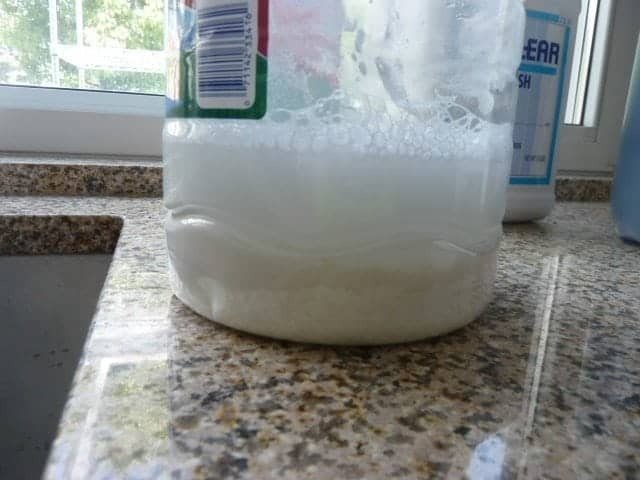 One-quarter cup of this detergent does the trick. If you use more than 1/4 cup per load, you can expect a couple of things to happen: Your clothes will come out of the dryer scratchy and stiff AND after a while you will notice your white items turning a lovely shade of pale grey. That’s the sign of too much detergent left in the clothes. 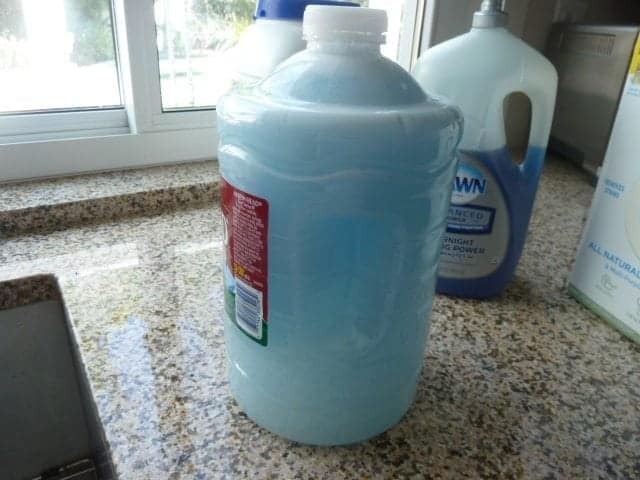 If you just cannot bear to use only 1/4 cup of detergent, make sure you double rinse. 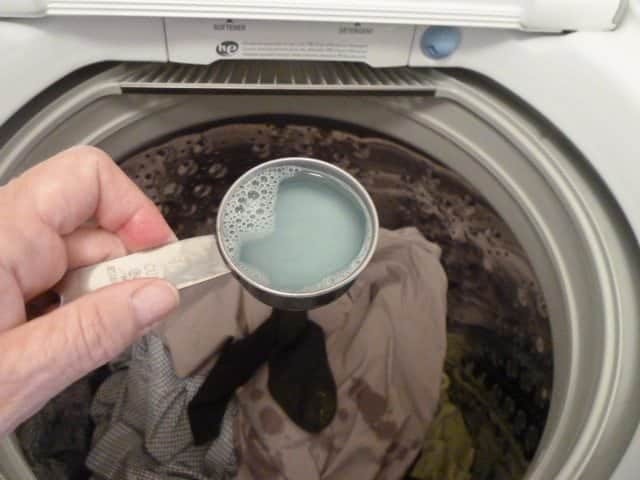 This detergent is absolutely low sudsing, which is what HE (both top and front loading) washers require. However, if you do not have an HE machine, this detergent is still fabulous and wonderful for your traditional washer. Remember that I used the Advanced Power Dawn in this tutorial? Well guess what? Something new happened that did not happen with the Ultra Dawn. I’m not sure why, and it seems to not be a problem at all, but after an hour or so, the Dawn separates and floats to the top of the container. So I just give it a good shake or roll before each use. Just thought I’d mention that, as I’m nearly sure someone would send me a message of concern over this fact. Okay, I think that about does it. Wait. There IS one more thing. If you can find it, great! But don’t feel like you need to send me a box of it when you do 🙂 I love my soda ash because guess what? It’s cheaper than Super Washing Soda. 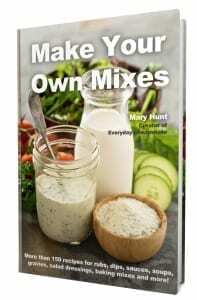 This recipe and procedure for making homemade laundry detergent (for less than a nickel per load, by the way) is so good I can’t imagine future improvements, but who knows? Post your comments, concerns, misgivings, worries, fears and joys. Really, I had no idea that laundry detergent could stir up so many emotions. It’s okay people, really it’s okay. Dawn will not void the warranty on your washing machine. Neither will borax, washing soda or soda ash.